Took it out today for its first real ride, I must say I'm very impressed with it. It's by far one of my cheapest builds and certainly the heaviest, but I had a smile on my face the whole ride. The race geometry really suits me. It just wants to go fast. Wish it had seat tube water bosses though. I'm swapping the saddle and bar tape to Fizik, and in the near future want to swap the heavy wheels for some mavic g40's with nice hubs. But she's good for now. I can hook you up with a heavier bike, no problem. Glad you like it. Sometimes good geometry and fit makes the extra weight a non-factor. Enjoy the ride and forget the weight! That and living in central indiana where its flat as a pancake. Weight doesn't really matter here. Very nice bike! One of my favorites. Nice ride! I use these to add water bottles to bikes without mounts. They don't scratch or rust. 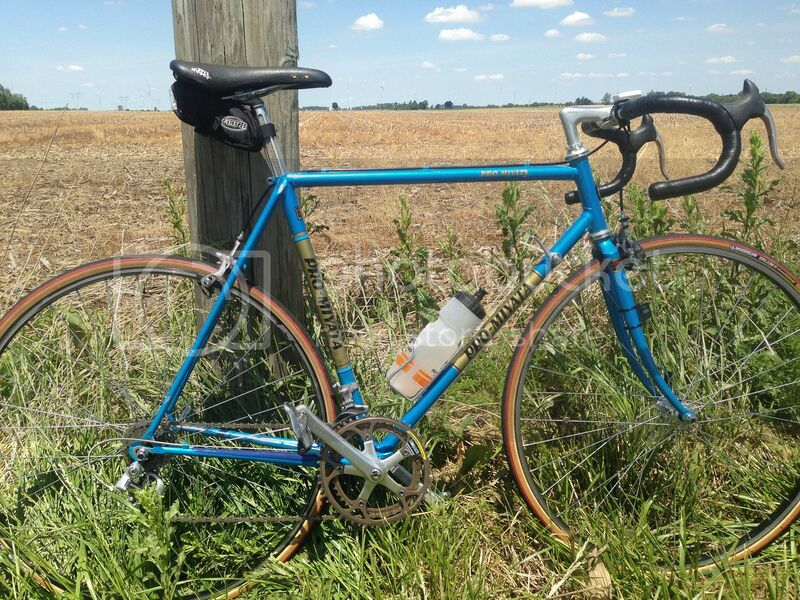 My team miyata was and is the best riding bike I have ever owned. It is also no super lightweight with splined tubing and investment cast lugs, fork crown, and bottom bracket. What is the difference between the Miyata Team and Pro? I have a Team, all Dura Ace. I'm guessing those shifters work alright eh? Last edited by RobbieTunes; 05-29-15 at 06:22 PM. Rob, looking good, glad you got it. My guess is the weight is in the wheelset. I have a '91 Team Miyata with HED Bastognes and it's comparable to the cf bike it replaced. Edit: didn't see at first that it's a 1981, probably heavier than a 1991, but not by a lot. I added a ST bottle with one of these. Worked great, and when I changed bikes...it changed too!! Nice. I've always wanted one of those with that color scheme. Not really sure why as blue isn't really my favorite color, but that color scheme just appeals to me for some reason. Those gold panels are just tight. I really like those. I "opine" that if you went at it weight-weenie-wise, you'd be rocking. Those frames are balanced, precise, agile, and light enough. Miyata was simply not fooling around. Rob, at first I was content with the 600, but I keep thinking more and more about an upgrade in the drivetrain.